An LVT-4 Amtrac passes a foxhole of the 7th Marines, 1st Marine Division at around 1030 Hours during the operation to clear Southern Peleliu on September 17, 1944. The battle to clear was is today Attalabul was marked eliminating one position at a time, often under fire from supporting Japanese positions. Ngarmoked Island, a small hill just offshore, was close enough to fire on the Americans, who first had to clear a path through a minefield. Naval gunfire and air support, which had been going on for days or weeks, seemed to have little effect except to strip the island of vegetation. 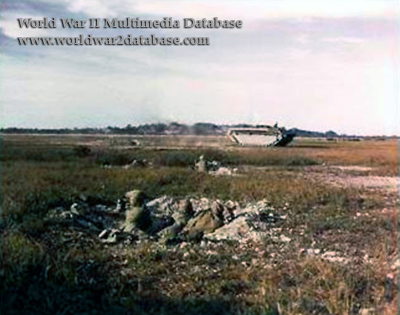 The heavy toll on LVTs meant that supplies were having trouble reaching the combat elements. The Americans were able to clear Southern Peleliu by September 18; the worst of the Japanese defense awaited 1st Marines at Umurbrogol, a steep series of hills that overlooked the landing beaches and the airfield.